The southern otter is an Indicator Species. This means that otters feel really small changes in their environment more so than other animals. If their environment's temperature changes just by a small amount, the southern otter may begin to move someplace that is either warmer or colder. When Indicator Species change where they live, or what they eat, it's kind of like a red indicator light flashing inside a car. When indicator lights flash, they signal people that some kind of action needs to be taken to make the red light stop flashing. Maybe the car needs gasoline. Maybe the car engine is too hot. Maybe the car's air filter has become too dirty and needs to be changed. Well, when scientists notice that an Indicator Species is changing their behavior this is an indication that there are most likely other animals living nearby that are also adjusting their behaviors. If too many animals discover that their environment is changing faster than they can adapt to the change, scientists work together to help reverse the changes taking place. The southern otter is also an Umbrella Species. This doesn't mean that otters use umbrellas when it rains! It actually means that when the otters' habitat is protected, wildlife living within the same otter ecosystem also benefit. The southern otter population in California occupies an area of Monterey Bay that is part of a Federal environmental protection plan, so it is likely that bottlenose dolphins, harbor seals, sea lions, as well as other marine and wetland species living here like it here because it is more "animal friendly" than other areas that are not protected. So the term Umbrella really means that otter protections shield other animals, just like sharing an umbrella in the rain can help more than one Westminster friend stay dry at carpool time! The southern otter is also a Keystone Species. This means that the southern otter is really important to the environment where they live. Students at WPPK could be considered a Keystone Species, because they create an environment that provides grown-ups with a wonderful place to work. Without all of you, there would be no reason for all the teachers and staff to come to school each day! Well, it's the same with the otters. When otters forage for food in the kelp forests of Monterey Bay they help to keep the undersea world of kelp forests alive and healthy. Too many sea urchins living in the kelp beds would destroy the kelp forests because sea urchins love to eat kelp! Fortunately, the otters love to eat the urchins! 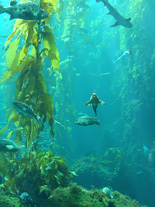 And because the kelp forests provide shelter and food for so many marine creatures, the southern otters help the beautiful, leafy green, underwater ecosystgem of kelp forests survive. The relatively small southern otter population in California helps scientists like Dr. Maldini predict how life in the sea, and in nearby wetlands, will respond to changes in our environment. Protecting the southern otter conveniently helps protect other animals living in the same area. The southern otter also helps keep their environment balanced and healthy. When there are many different kinds of creatures living in one ecosystem, the ecosystem is by definition, healthier and more sustainable. Unlike polar bears, seals, and walruses, southern otters do not have a lot of blubber to keep warm. Instead, they have a lot of hair! Their hair is so thick that it is like swimming around with a soft, warm, insulated blanket!